Mobile phone usage has exploded. A 2015 Pew study reveals 64 percent of Americans own smartphones, nearly twice the 2011 number. Mobile Internet access now exceeds desktop access, with the gap widening. Mobile Internet users crave visual content, videos and high-quality images in particular. Mobile Internet use is conditioning Americans to notice, demand and consume high-quality visual content wherever they can find it — in printed marketing materials, slide shows, digital signage, etc. YouTube, the world’s most popular video website, has more than 1 billion users. Instagram, a recent social media entry that is photo/image-driven, already has more than 400 million active users — many of whom are in younger age groups. Marketing professionals admit to a significant problem of content overload. Companies are producing an overwhelming amount of text-based content for marketing purposes, across all verticals. B2B and consumer markets are overwhelmed by all of this and are beginning to tune out text-only communication. Thanks to social media and other factors, the human attention span has plunged from 12 seconds in 2000 to eight seconds in 2015, according to a widely reported study. Goldfish now have a longer attention span than humans, posing new challenges for marketers indeed! Companies, healthcare facilities, educational institutions and other organizations that have used digital platforms as internal communication tools for marketing are now in an environment where they can obtain a terrific boost in ROI by ramping up their efforts.High-quality video and imagery, in combination with text, will capture user attention, hold it, and make the message memorable. Place big screen displays in public areas — concourses, waiting areas, outdoor spaces, convention halls, etc. — with a combination of organizational news, advertisements, brand messages, headline news, weather and sports information. 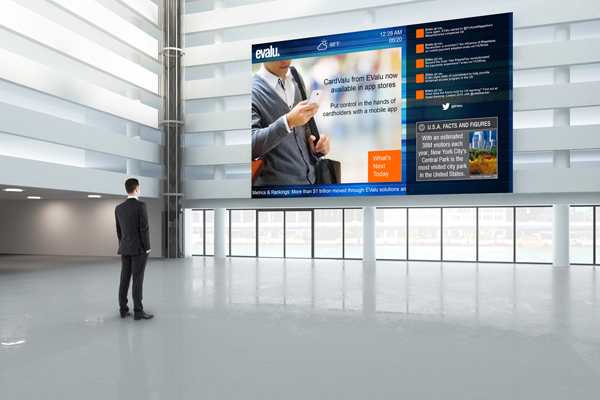 Place smaller digital screens in lobbies, offices and other on-site locations with the same combination of messaging — far more useful to the organization and guests than simply broadcasting a television program. Where digital signage is in use or put into use for wayfinding, interactive kiosks for visitor information access, meeting room agenda postings and other non-marketing purposes add marketing and branding communication to the content menu. Short, rotating, visual messages with an emphasis on high-quality imagery enable organizations to reach and influence people by accommodating their preference for visual information and their short attention spans. Digital marketing solutions have gone from a marketing frill to a necessity. Are you ready to meet the challenge?